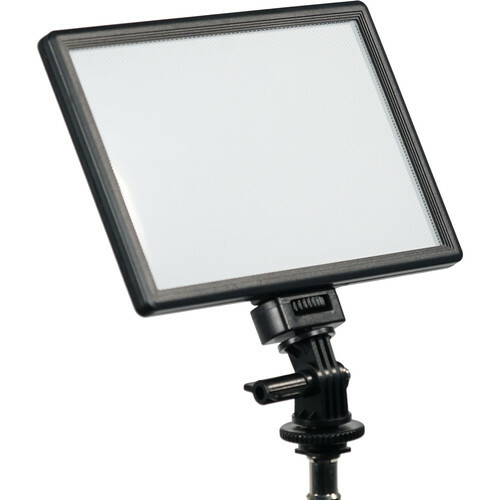 The ME116 Bi-Color Slim On-Camera LED Light from GVB Gear features an LED honeycomb design. Equipped with 116 LEDs, this bi-color light has high-brightness and soft-light output. It allows you to shoot a music video in a dark room, or a YouTube video in a room with no access to exterior lights. You can adjust both the brightness (20-100%) and color temperature (3300 to 5600K). Weighing less than a pound, this on-camera light is easy to carry. Box Dimensions (LxWxH) 11.1 x 6.1 x 1.7"
ME116 Bi-Color Slim On-Camera Light is rated 4.8 out of 5 by 6. Rated 5 out of 5 by EJ from The Best Video Light Out There No need to go any further. This is the light you need. I own a lot of video lights and this one is the best one I have. It's light, bright, and compact. It really helps my videos look better. It's also easy to travel with. It works wells on my Sony a6500! Rated 5 out of 5 by Anonymous from BEST VIDEO LIGHT I OWN I own many video lights and this one is the best one I have. It is light, bright and compact. There is no need to go any further, if you are looking for a video light, buy this one. I would definitely recommend it. It goes well with my Sony a6500! Rated 5 out of 5 by Manatazach from Headlight made me famous. Thanks, to the GVB Gear ME116 Bicolor Slim On-Camera Light. This light made me famous in the Celebration of Grandmaster Ernest Hyman event. Many professional asked me about the light. It also helped their picture taking. Great invention! Rated 5 out of 5 by William from very good light I'm using it for a light source for a 4x5 enlarger using my view camera. Rated 4 out of 5 by Rafael from Good enough Great for lowlight conditions. Light. It comes without battery.